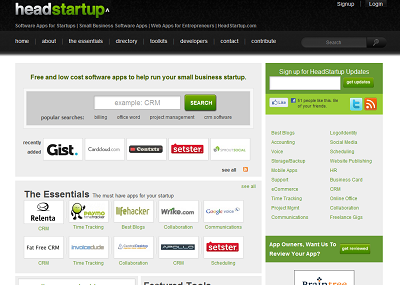 HeadStartup provides detailed/hands-on reviews of web-based software apps for small business startups, entrepreneurs and freelancers. HeadStartup currently has several hundred reviews that are easily searched by keyword or tag. Also, the reviews found in HeadStartup are always written in a way that is easy-to-read and never overly technical. HeadStartup reviews apps that are either free or low cost and specifically designed for small business startups. Also the HeadStartup database is easy to search (by either keyword, category or tag), and never overly technical allowing even the most bootstrapped and non-technical startups to benefit from the website.